I've written before about the frustrations I've had with reading to Dashiell. The boy just won't sit. When Annabelle was his age, she would sit for the longest time. I remember the toys not being touched some evenings but the books would be a mess! Dashiell is a different story altogether. He is always on the move and he just won't sit still for a book. During the day I will let him just crawl around while I read, thinking that atleast I'm reading to him right? At night I try to read atleast one but by the time we have both of them in their pajamas, he is ready to pass out. I pick up a book and he once nothing to do with it. I've found that the books with lift the flaps keep his attention the best. And books with pictures of babies. Bonus if it has both! The other night he literally pulled a book out of my hand and threw it on the floor. So whatever it was, was not keeping his attention. I will keep at it and just steal moments when I can. Here are some I will be trying this week! I love the DK Peekaboo Series. It has both lift the flaps and pictures of babies. Woo Hoo! Dashiell loves playing with these books. 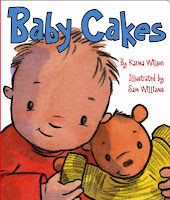 Karen Katz writes wonderful books for babies. They are beautiful and tactile and many have flaps. Here are a few we have at home that Dashiell will sit still for. Dashiell really likes this one too. It has great rhythm which I think he enjoys. No flaps but pictures of babies. 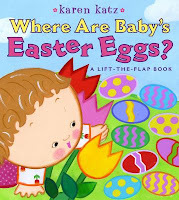 My daughter loved the karen katz books when she was a baby, too. I think they are beautiful. I adore Karen Katz and Karma Wilson. So have my kiddos. Fun recommendations. Yes, when B was younger she didn't sit well so if she crawled off my lap I just kept reading out loud and then she'd wander back and look, leave, I'd keep reading and she'd wander back again. We were in her room so she never got out of earshot and would sometimes even crawl back up on my lap or bring me a new book. I never force her to finish a book that she's ready to be done with. 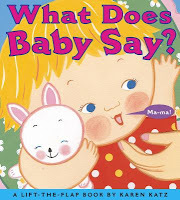 Isn't it funny how little kids love books with babies. My daughter does, too. Thanks for stopping by my blog from The Girl Creative. Can I be your new friend for New Friend Friday? I'm here because you're on the PEAR list so I wanted to say hi. BUt I also see you're on several of the other lists I visit. i.e. Marketing Monday, Follow Friday, Follow Me Friday, and PEAR and SITS.So HI times five. Great book suggestions! I'm always looking for new books for my son. Luckily he loves to read. Makes for some excellent quiet time!